One of the issues we had at BarCampMilwaukee is that we did not have an easy way to immediately notify people of things. This problem may be unique to the space we were in (Bucketworks) which was large (huge actually) and had no intercom or PA system, at least none that we knew of. Things like letting everyone know when sessions were starting or when lunch arrived, or even just trying to find someone in Bucketworks, would have been easier with an intercom system. 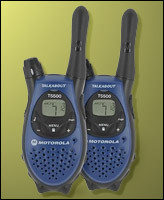 We could have done something as simple as put an FRS radio in each session room to alert people as to what was going on. (Sadly, I had three radios with me, but didn’t think of it at the time.) I know at least a few times I had to stop sessions from running over their time (only because the space was needed by others) or had to let people know that the session would need to end in 2 minutes. Posted on Tuesday, October 3rd, 2006 at 5:00 pm. Subscribe to the comments feed. Both comments and pings are currently closed. Post on your own blog.